Children with Cerebral Palsy (CP) has the risk of disrupted growth and development during their childhood, teenagehood and adulthood. With such condition, the parents and family, surrounding people, schools and health centres have to meet the basic needs of the children as stipulated in the Indonesian Law No 23 Year 2001 on Child Protection that states the right of children to live, grow, and participate normally as well as get protection against violence and discrimination. UGM Academic Hospital (RSA UGM) in cooperation with Wahana Keluarga Cerebral Palsy (WKCP) NGO hosted a book review and workshop on cerebral palsy at the UGM Academic Hospital on Monday (5/10) entitled The Help Guide to Cerebral Palsy to give contribution and skills to parents to overcome problems affected by CP. 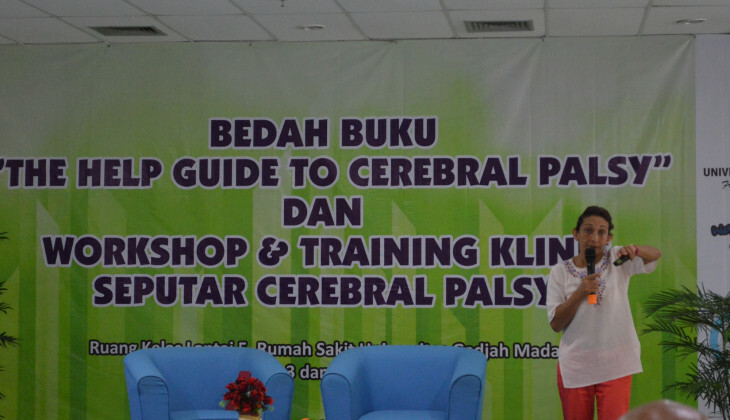 Chairman of the event, dr. Ade Febriana Lestari, M.Sc, Sp.A, said she hoped the book review and workshop would help families to understand problems and needs of children with CP. "Hopefully, parents’ confidence can grow in taking care of their children, leading to the well-being of the children,” Ade Febriana added. Also attending the event were Prof. Nadire Berker, MD with Cerebral Palsy theories and Prof. Selim Yalcin, MD with Cerebral Palsy evaluation tips.